It started as a small seed potato farm selling out of a pickup truck in the 1980s. 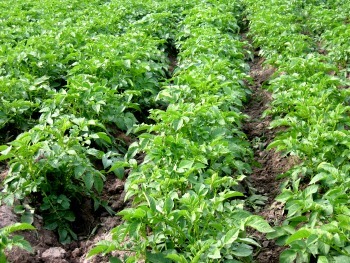 Today, Ronniger’s Potato Farm, owned by David Ronniger and family, is operated on 106 certified organic acres and sells very unique and valuable strains of seed potatoes across the country. They sell to small hobby growers, market gardeners, as well as large farms that purchased little-known varieties from them ‘way back then,’ and who are now growing large amounts of those types which have since become well known. The farm is located in the northeastern corner of Idaho at the foothills of the Purcell Mountain Range. Ronninger’s is an example of a farm taking one familiar crop, the humble potato, and making it as glorious as humankind can as yet imagine. Along with their major focus on potatoes, they sell cover crops, garlic, onions, sea salt, books on eco-farming, and now also have a sideline business of raising Haflingers, a somewhat rare, small draft horse breed with many qualities they find quite valuable. Humans have a long history with the potato, which is reported to be a good source of protein, vitamins and minerals along with the carbohydrates it’s most known for. Peru’s natives are given credit for being the first to cultivate it at least 4500 years ago. Interestingly, after Spanish explorers brought potatoes home and they spread across Europe to Ireland, hybrids were eventually introduced leading to the famous potato famine, and yet blight resistant potatoes were producing well in Mexico at the time. Genetic diversity and avoiding dependency on one crop type is a major bonus to keeping a wide variety of open-pollinated and heirloom varieties of all crops in production. Beyond this, variety is just plain enjoyable and makes cuisine an art rather than a routine. Customers are becoming more and more open to wider assortments of their favorite staple foods, including the potato. Ronniger’s farm is well prepared to meet this demand. Ronniger’s sells potatoes in the usual categories of late, mid-season, early and fingerlings, and in further categories of yellow, red (red skinned), red/red (red skin and flesh), color-splashed, white, russet, red/gold, blue/white, blue/blue, rose, and those in the categories of best keepers, heat tolerance and scab resistance. A sampler of the intriguing varieties includes “German Butterball,” a late potato with flesh described as bright yellow as creamery butter with award-winning flavor. “Maroon Bells” is a mid-season potato with dark maroon flesh and skin. “Viking Purple” is also mid-season with true purple skin splashed with pinkish red, and snowy white flesh. “Austrian Crescent” is an abundant yielder of fingerlings up to 10 inches long with yellowish tan skin and light yellow flesh. The farm notes that fingerlings are very popular at farmers’ markets. While Ronniger’s specializes in a rainbow of varieties, they insist on quality, not just pure novelty. Over the years, they have tested many types that sounded promising, but dropped them if they didn’t live up to flavor, yield and vigor. Highly active and beneficial soil microbes and enzymes are also a major part of the farm’s soil enrichment program. “We do use soil amendments other than cover crops,” David said. “We use composted pure chicken manure the fall before we plant. We test our soil, balance our pH to 6.7 or less and add the minerals in organic forms to complete. Our preplant application of microbes with enzymes is 30 - 40 days prior to planting to enhance the ever-present colonies. Our seed is inoculated with more microbes along with a bit of fish, feather and alfalfa meal drilled with the planting of the seed pieces. Owen Mullen of Sunlight, Inc. is a consultant to the natural products industry who works closely with the Ronniger farm. He feels that the life force energy in the soil is a most important ingredient for crop health. “I have been an herb farmer and an herbalist,” he said. “I have always wondered what made herbs work and three years ago I got onto it.” He explained that regardless of other factors, there must be life force in the soil. “If the energy is not in the soils then the plants can not get it, so it must start with high energy soils,” he said, adding that the other factors such as soil microbes and minerals are also part of the energy system. “It is the ‘hertizian frequency levels’ that the herbs pull from the soil via microbes and enzymes,” Owen said. “The soil must also be balanced minerally for the energies to be high. It is quite simple once you understand the natural process. It is soon to be a standard for measuring quality and efficacy in products. It can (now) be measured in several ways, a hertizian frequency monitor (BT-3), pH levels, tissue analysis, or Kirlian photography. They all indicate energy levels. Ronninger’s now reaches its markets in a variety of ways, including a print catalog and a web site. The print catalog has a pleasing color illustrated cover and is sprinkled with inspiring quotes and commentary, as well as valuable information on potato growing, storing, and harvesting. They offer their print catalog free and in quantities to groups such as Master Gardeners and garden clubs, and they also offer gift certificates that come with a copy of their print catalog. Their online presence lists all their products, the farm’s history, and they answer your questions quickly via phone or e-mail. Customers may telephone, mail or fax their orders. Haflingers are a unique draft horse breed reaching 13 to 15 hands in colors from light blonde to dark chocolate, with white or flaxen mane and tail. “We have 16 Haflingers with eight due in the spring,” David said. “The Haflingers are a separate sideline, but they fulfill a purpose on any farm. Our horses can work as well as ride and drive. This is one of the most unique breeds on the planet - very willing to learn as well as come to you when you ask. They are friendly, docile, beautiful and inquisitive -- the horse that captures everyone's heart.” The foundation sire of the Haflinger was a cross between an Arabian stallion and a refined native mare of the Austrian Tyrolean Mountains. After years of working alongside humans, the Haflinger developed some wonderful traits that include sure footedness, hardiness, small (yet strong) and able to do well on minimal pasture, and a dependable and affectionate disposition. Humans now use the breed for many purposes, including jumping, trail riding, driving, and certainly for draft purposes on a farm. Like so many successful eco-farms, Ronniger’s stayed focused yet flexible over the years, with a practical foot firmly grounded in the soil and needs of their current society, and always an ear for new sustainable growing methods and additional products to trial and offer. Since this profile was written, Ronniger's has now partnered with Milk Ranch Specialty Potatoes, and together they are now called Potato Garden. They can be found at potatogarden.com.